Tuesday’s decision by Missoula District Court clears the way for HomeBase Montana to apply for a deconstruction permit for the Missoula Mercantile and begin redeveloping the downtown property with the Marriott hotel pictured here. A District Court judge on Tuesday found the City Council exercised reasonable discretion when it granted a partial demolition permit for the Missoula Mercantile, and it dismissed all other matters in the case as being moot. The decision clears the way for Mercantile LLC to seek a deconstruction permit from the city and begin efforts to redevelop the downtown property with a new Marriott hotel. In his ruling, District Judge Dusty Deschamps acknowledged the Mercantile’s rich history and the role it has played in regional commerce. Still, he said, the issue was a legal one, and not a political or philosophical one. A group of preservationists led by Preserve Historic Missoula had attempted to block the building’s deconstruction and redevelopment by Mercantile LLC, which plans to build a $35 million hotel on the downtown corner. In filing its lawsuit, the group challenged the procedures use by the City Council when it overturned an earlier decision by the Historic Preservation Commission, which had initially denied the developer a demolition permit for the property. Preserve Historic Missoula had attempted to argue that the City Council had reached its decision in an “arbitrary and capricious” manner. Deschamps disagreed in his ruling, saying the city followed its own rules and regulations, and exercised appropriate discretion. Andy Holloran with HomeBase said the court struck the right tone in describing the Mercantile’s history and sentimental value felt by many city residents. He said the development team was not looking at the court’s decision as a victory but rather, as a step forward. The decision puts to rest nearly 11 months of public hearings, testimony and legal wrangling. While Holloran agreed with the judge’s personal reflections on the structure’s history, he maintained his position that the building had outlived its useful life. In its place, Holloran said, the development team looks to restore the corner’s vibrancy and commerce. Under the development agreement with the city, the developers must preserve the pharmacy portion of the expansive Mercantile structure. The developers have said they plan to integrate many of the building’s historic components into their redevelopment project. In a statement released shortly after the court’s ruling, Preserve Historic Missoula said it was “profoundly disappointed” by the outcome. The group is asking the city to review its preservation ordinance, suggesting the process is flawed. With the court’s ruling now made, Holloran said his team would move forward with its project and seek the input of the city’s preservation community as the project advances. Preserve Historic Missoula also attempted to argue that the City Council’s decision to grant the demolition permit violated the Missoula Downtown Master Plan. In doing so, the group suggested that the council erred by not giving enough consideration to the plan’s mention of historic preservation. 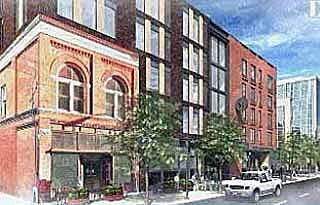 The project will preserve the pharmacy portion of the existing Mercantile. While the 2009 master plan does mention historic preservation as a goal, it also seeks to strengthen and expand downtown Missoula’s role as an economic and cultural hub. “The City Council was tasked with proportionately balancing these objectives, and by not singling out two objectives to the exclusion of others, (it) appears to have done so,” Descamps ruled. Missoula Mayor John Engen also responded to the court’s decision.